Comfortable pack with decent storage for a day outing. I've used the Rim Runner for about a year now. I had been using a day pack that would have been more useful as a school backpack, and spent some time looking for an upgrade. In the past year my Rim Runner has piggybacked me for several days out on the trails while hiking about. I'm a fairly large person, and it fits me well. I did remove the hip belt, which was factory removable by the way. To get a day pack that fits my torso, I actually start to get up into weekend/backpack sizes. The fit of the shoulder straps, and the sternum strap are great. The shoulder straps are well padded, as is the part of the pack that sits against my back. There is a ventilation area designed into the pack, to try to keep your back cool. I sweat a lot, and it really doesn't seem to do much to keep my back cool, but in my case it's probably more of a genetic trait than pack failure. There is good room inside, even with a full water bladder in it, for a small first aid kit, overnight survival gear, food for a day, maps, compass, and other necessities. The front pocket has a great organization area for the smaller gear. The middle pocket is just one large pocket. The main pocket of course holds the water bladder, but there is room for more in there if you need it. Once loaded there are four compression straps at the corners to hold everything in place. They work well and seem to hold their tautness even when wet. In the year I've used it, I haven't had any abrasions or holes pop up in the pack, which is already better then my previous day pack. It's comfortable on my back, even with my large frame. I'd recommend this style of pack to my friends if they asked. A fantastic day hike backpack with an integrated hydration system. Plenty of storage in three zippered compartments and side pouches for bottles. Chest and waist straps. I went through a number of backpacks before finding the Rim Runner and settling on it as my all-purpose backpack. The hydration system stores 100 oz of water and works very well. It doesn't come with instructions so you have to figure out how to assemble it, clean it, etc. I recommended getting the separate cleaning kit for the hydration system with brushes and hangers. There is plenty of storage space for packing what you need on full day hikes. Small webbed pouches are in the front zippered area and it can hold a water bottle on each side. The back area distributes the load evenly and is comfortable. It comes with adjustable chest and waist straps. I don't use the waist strap and have removed it. 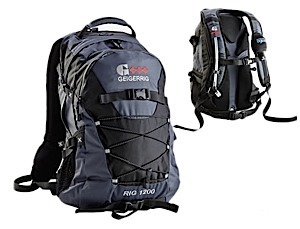 The pack is light weight and rugged nylon. I have been very happy with it for more than a year and have taken it on multiple 10 hour excursions. That said, the Rim Runner is a great daypack. 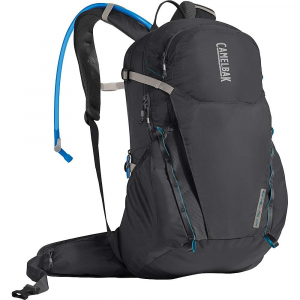 It offers a good amount of storage, 3 liters of hydration, ample pockets and loops for a day's worth of gear, and great construction. Mine has a smaller front storage area with an organizer pouch, a larger main compartment, a small fleece-lined pockets for electronics, sunglasses, or other delicate items, and two external elasticized mesh pockets. I can use the Rimrunner for a very light overnight trek with my small tent (w/rain fly and poles), a light fleece sleeping bag, small backpacking stove and fuel, food, etc. 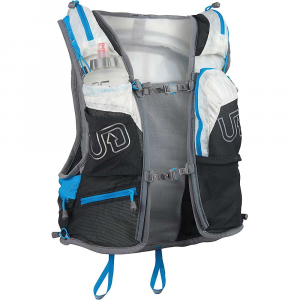 The hydration bladder is bomber and trouble-free, the whole hydration system works like a charm. Construction quality is good, pack is comfortable to wear, and it's definitely an easy pack to recommend. I purchased this pack for day hikes and I wanted a hydration pouch because if I carry a bottle in my pack, I don't drink enough. I am too lazy to get it out of the pocket it is in and drink. I like its size for a day outing, enough space for a rain jacket and more. The straps make it easy to tailor it to the size you want. The quality is good. Bottom line is I really like this pack. I am a woman, 5'7", and this pack fits me fine, so I would call this pack unisex. I find it comfortable. The straps are highly adjustable. The capacity is fine for a day hike, enough space for a rain jacket and some food, socks etc. The two side pockets are handy for an extra bottle or snacks. I don't load it much for what I use it for, so it rides fine. The straps adjust to different loads. It looks well made. Time will tell, but my experience with the brand for the past 20 years has been great. I went on one hike so far. Welcome to Trailspace, Elisa. I hope you'll update us in your review on how your pack works out for you. Overall good product. Use for longer day hikes. A generally good product. The straps can cause a little fatigue around the neck and shoulder on longer hikes. Definitely for walking and NOT running. Holds plenty of water with additional side pockets for two water bottles. easy access to gear with a full zip opening. Holds plenty of food/gear for a full day of hiking. For taller people the waist strap rides high and is better just taken off. 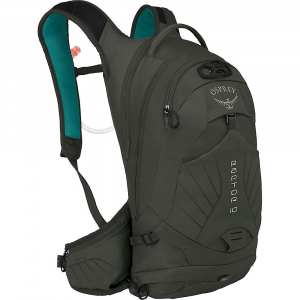 It is great for hydration with an easy to fill large Camelbak bladder and has plenty of space but it does lack on the side of comfort and adjustability. I like it enough to use it for a few years until it wears out but would not necessarily buy it again. Have had much better luck with comfort using Gregory packs. It is a good value with the included hydration pouch but if you can afford it I would buy a pack separately based on comfort and buy a hydration pouch separately. Thanks for the review, Nicholas! Do you have any pictures of your Rim Runner you could show others in your review? 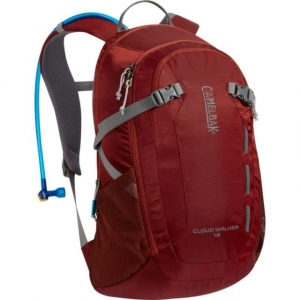 This is a great all-around pack that has proved to be very durable. This has generally been a great pack. I've used it every other day for years. Roomy enough for a bunch of outerwear as well as a supply of toiletries, tools, etc. The main thing I'd nitpick is the side pockets, which are not adequately designed for anything I care about losing, which is a shame since they'd be very convenient. This is quite frustrating since many of my friends utilize side pockets for oodles of stuff. There are interior mesh pockets which I use for sanitizer/suntan oil/etc. However, everything falls out of them as soon as I open that section of the pack unless it is kept religiously upright. Forget and lay the pack down and the entire contents are instantly rolling around in the dirt you are on. They need to be deeper and/or have velcro/snaps/drawstrings/zipper/something to keep them closed—same as the side pockets. Welcome to Trailspace, Nick. For what activities do you use your Rim Runner? Source: A lifetime guarantee return. An exchange issued under Camels' lifetime warranty program. My original (see picture) was about 14 years old, and the zipper system failed completely, so I received this replacement for free. 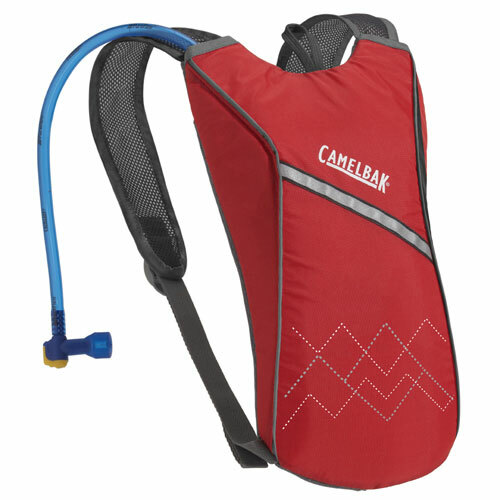 Camel even included a new top of the line hydration bladder, for the one I did NOT even send back. I have a concern with the zippers appearing to be of lower quality than the original. Returned this old worn out original, and received new from Camelbak. Pack does fit well with very cushioned straps as well. The advertised volume is very true to size-maybe too much(?). Accessibility is very good, and directly up front is area for the immediate needs. Depending upon how you load it the pack might be bottom heavy, just gotta find your settings is all. Sounds like you got a good deal with CamelBak's warranty, Cacher. I'm curious, did you notice any major differences between the two vintages of pack? Alicia MacLeay the differences I noticed are that the material seems a tad bit thinner than the original as well as the zippers not being as "industrial", also that there really is no built in hanging 'port' for the water bladder. The originals material appeared thicker, and zippers more industrial, with a bladder hook inside. Interesting, Cacher. Thanks for sharing those differences. Great day pack, just a few little things make it uncomfortable. First off, my pack is NOT the one pictured. But it is a Rim Runner according to the tag. This is the model I have. I believe it's a 2007 model. I have used and abused this pack and it has stood the test of hard time. I love the compression straps, the back padding, the shock cord on the front of the pack and the little loops right above. This pack has went just about everywhere with me and has taken some abuse. It has bounced off rocks and taken loads it was never meant to haul to secret campsites. Now days it goes with me on at least 2 hikes a week that are 3-8 miles in length. When I went for a Camelbak I was going for a small daypack and I got more than I thought. I can pack for an overnight in this pack if I get just a little creative. Panel load makes it easy to fill and sort, and the second pocket has a nice little organizer where I keep important things like a pencil, some toilet paper, small first aid, small fire kit, esbit stove. its all kept safe by a waterproof zipper. It will haul it all. The issues I have with the pack are all related to comfort. It happens at any weight. Full bladder and rain gear seem to weigh it down sometimes. Let's start with the 'hip belt'. In my opinion a pack this size should have more than a strap. This particular strap is removable. It attaches to plastic rings that are supposed to be padded. However when you attach the straps and attempt to let the pack ride your hips the plastic rings end up below the padded wings and right in your hip bones. Constant adjusting is required. I could honestly deal with the strap if the little wings were a bit thicker. Gripe number 2 has to do with the frame sheet. While it is an amazing feature in such a small pack from 2007, it is sewn in.... improperly or poorly. I don't know exactly what is causing the problem but it is placed in a weird way and the bottom corners curl in and poke you in the back. Camelbak literature claimed that I could attach hiking poles easily.. I haven't figured hat out yet. I just shove them in one of the water bottle pockets and clip the top compression strap around the handles. 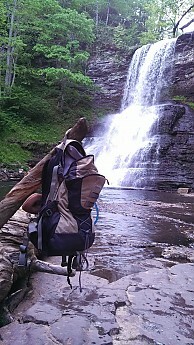 The gear loop at the bottom of the pack hasn't really been used for anything but hanging my pack to dry. Things that would help this pack.. Load lifters.. I know there isn't really anywhere to lift to but strapping it down gets uncomfortable. I plan to add some vertical compression straps across the bottom as well. With the compression straps the way they are everything just kind of wads up in the bottom of the pack and gets really uncomfortable. In the long run, I would suggest this pack to anyone. It's versatile and tough. Carries everything you need for a whole day or even a light overnight. Owned a Mule first and used it on lots of day hikes, changed to the Rim Runner in 2009 and what a great move that was, lots of room and very good fit, even used to hike the Virgin river in water, no problems with water in pack or poor fitting. This has been updated since the photo shown. I recently purchased this bag for both school and 1-2 night camping trips/vacations. I have not been disappointed!!! Strong, sturdy! It's skinny too which is nice. Very light, huge water source! Easy set up and take down! Holds everything I need for both my uses! I bought the burnt orange, which I highly recommend! It is the prettiest color for sure! Hasn't failed me yet! I highly recommend this bag though!!!! 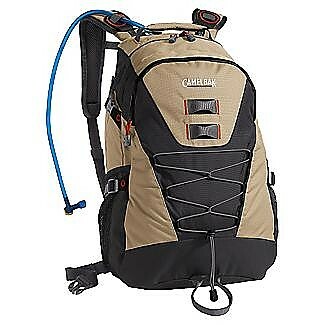 Bigger than my Camelbak Rogue which I use for short day hikes and biking, but smaller than my Jansport Big Bear! Really it's perfect! Even my girl-friend is jealous! I usually have 2 binders (3 section) and my macbook. Holds all of it perfectly! When camping my marmot bag gets lashed to the outside, thermarest pro-lite plus, inside, mess kit, food, tent, extra shirt and jacket...Really! It's the best bag I've ever owned (5th backpack i've had) and definitely my favorite! Simply put, an excellent day pack. Plenty of room (1500 cubic inches) for gear and extra clothing if needed. The 100 ounce bladder comes in handy on those long, hot days (I day hike anywhere from 8-15 miles). Fits comfortably even on a big boy like myself. Bought this for extended day hikes with the better half and kids. I have not been disappointed. The pack rides wonderfully and half the time I forget I even have it on. It has lots of pockets making it easy to compartmentalize the entire thing, which in turn makes it very easy to find what I want when I want it. Hiking with the better half and two young girls, you find yourself carry lots of "extras" that you just never know when you might need (Hairbrush??). Yet is all rides comfortably. As the extra layers come off the kids, I have plenty of room to stuff them in the pack, and never notice the extra weight due to the great harness set up. The outside rigging makes a great place for muddy or wet items. I would highly recommend this pack for anyone looking for a comfortable and easy to use day pack. I bought this pack in 2001 as a daypack. Soon discovered that it was way more. I have used it for overnighters, day hikes, and it has been great since I have gone back to school. I have used this pack every day for 6 years and it is still going strong. Perfect size for most day hikes. 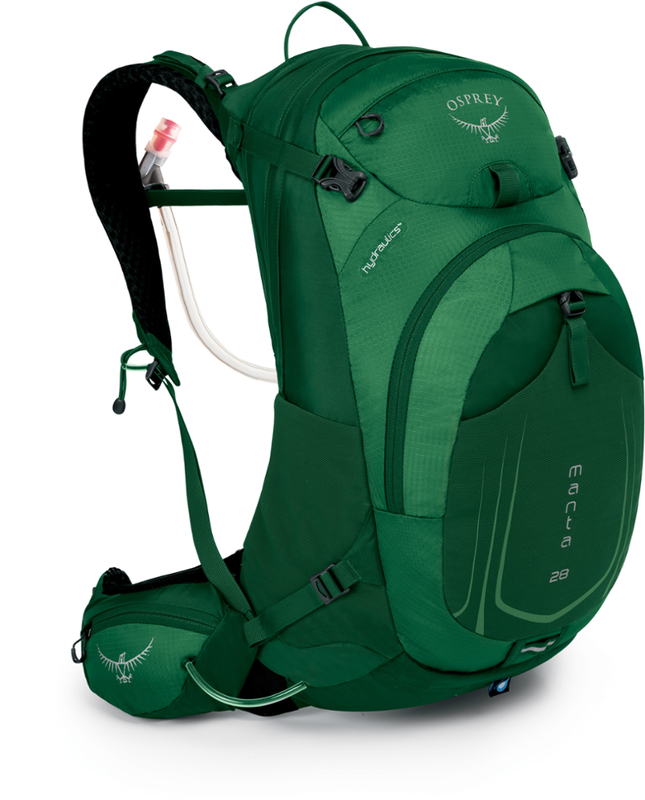 It carries 100 ounces in the bladder, and water bottles filled with gatorade will fit in the side mesh pockets. I use the large main pocket for clothing and food, and store the little items of the "10 essentials" in the smaller front pouch. The smaller front pocket has a mesh pocket inside and small open pockets for odds and ends. Excellent quality pack. My only complaint is that it does not hold much. It works all right for a moderate length day hike.